Recipe came from a chinese cookbook for a basic Egg Noodles. I ask Pauline D Loh about La Mian (pulled noodles). she told me just rest the dough for a while..then slowly pulled it till its 4 to 5 times its original length. I don't have the skill of a Noodle Master..so I did this one strand at a time. it was very time consuming. But the end result was delicious. Even my mom ask for some for herself tonight. **use corn oil to replace 2 eggs if you want a no-eggs version. * dough should be dry not sticky. 2. Leave it aside(covered with a damp cloth) for 30 mins. 4. Dust with tapioca flour, roll up like swissroll and cut. 5. 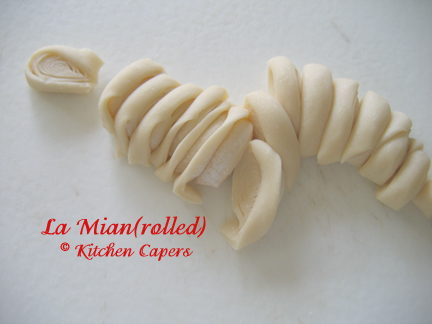 Remove/separate and slowly pull each strand of noodle till its at least 4 times its original length. 6. Roll up and form a ball and do the rest. 1. Boil a pot of water, add noodles in to blanch for 3 to 5 mins till soft. 2. Drench in cold water for 30 seconds. At this stage, you can either add to soup to cook, or stir fry with other vegetables/meat etc. Pasta machine saved me a lot of hard work, but not much time... as the dough did need a lot of resting time in between rolling. 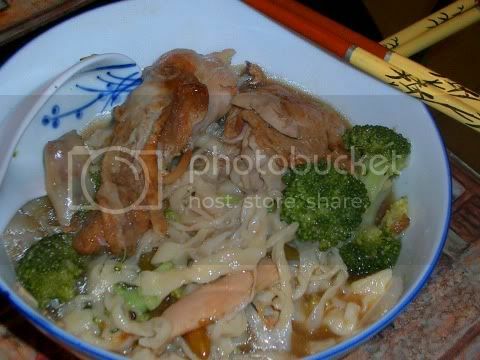 Gina, thank you for sharing the recipe, and your noodles look very smooth! you are very fast! Pauline had a pasta machine, but she says that manual pulling makes the best noodles. provided you had practice to pull them a big batch at one time. she told me that after the noodles have been pulled and rested into a ball, you can use your fingers to toss them again..and they can be even more smoother..
she say pasta machines are good for pressed and uniform noodles but if you like La mian more, can forget about buying a pasta machine. 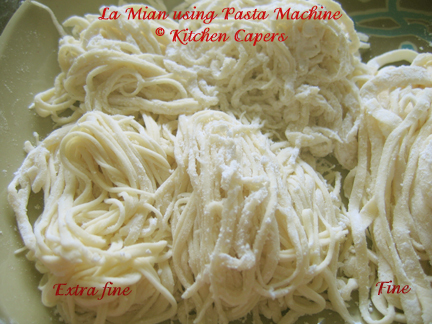 Once I saw your smooth la mian, so couldn't wait Thanks for the tips on making it even smoother. 1. NEVER wash the pasta machine with water. It will make it RUST. 2. Even if its oily, just add tapioca flour to dust it. She said that manual ones are better than electric motor ones. I think I need to borrow one from her to play first. actually, she said that the Noodle Master just cut and roll into a long tube and pull, swing, pull, swing..and soon you have La Mian. But I don't have that kind of skill. I was thinking of at Step 5, instead of pulling it manually, feed it into the machine to press it flatter. u think workable? I am thinking out of the box..no machine for me to play. ai ya i don't have machine to play ..! so upsetting. I think just go and buy one and be done with it. the folks at Kitchen Culture are very nice..email me and send me all kinds of reviews of different brands of pasta machine I could get. I told them the basic criteria is price..must not exceed $100. but all said to get a manual one than motorized version. the kitchenware shop I frequent near my place sells pasta machine too. In fact, the Megar Departmental store sells a lot of stuff. Even those Indian claypots for cooking curry. They also sell old traditional chinese charcoal pot. Remember those our grannies used to use to brew tonic soup? My dad bought one for me from a wet market stall in Toa Payoh. I think it's much cheaper than those sold in CK Tang. That was a while ago, as I have not been back to S'pore for 3 years already, not sure if you can still get them from the markets. Give it a try coz It's almost 30 to 40% cheaper. Think he bought it for $30. 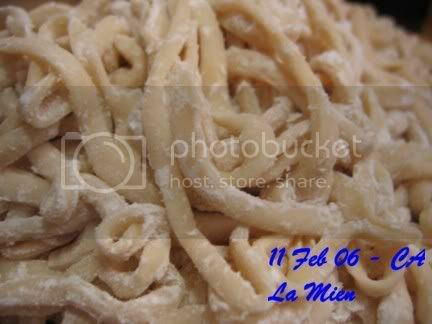 I will try ther la mian tonight. Wanted to make the wonton noodles done by sinner but now the la mian looks good too. she said that the Noodle Master just cut and roll into a long tube and pull, swing, pull, swing..and soon you have La Mian. But I don't have that kind of skill. The machine doesn't work that way, but don't worry, when you get yours you'll understand. very good thinking sinner... I did this step, but let it cut through the dough without any problem to catch a whole bunch of strands. Then pulled the whole thing, that's how I saved time. But now come to think of it, better to let the cut strands rest for 5 mins (as the gluten still tense after all that rolling) before pulling, that's why mine (on right) is not as thin and as smooth than Gina's. I made La mian tonight! Took me almost 2 hours to pull the noodles strand by strand. Wanted to make them thin, but kept breaking. so my la mian is not very beautiful like Gina's. However, the texture is very silky and soft. Cooked a braised chicken sauce to go with it. Made half the recipe, enough for 4 bowls. I cooked it in hot water to blanch the noodles. Then fry all the ingredients and added the noodles in to stir fry. And then added some chicken stock to make the gravy. I finally bought the Pasta Machine from the kitchenware shop at Hougang Green this afternoon. There is no change in ingredients except that the method used was slightly different. I spent the first 10 mins struggling with the machine, learning how to use it, trying the different width(dial). 1. Cut a piece of dough, slotted it into the machine to press into a nice flat dough(like a giant piece of Wanton). 2. Turn the Dial to narrow the width/thickness and run the flattened dough thru it again. 3. Next run the flattened dough thru the slot that cuts into thin fine shreds. 4. 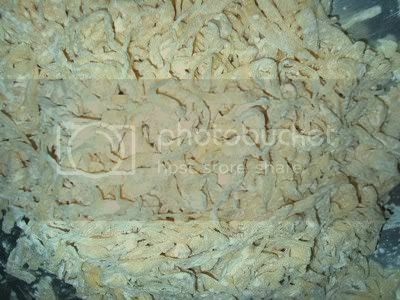 Dust with tapioca flour and rested the noodles. 5. I let it rest for 10 mins. 7. Then roll/fold into a bundle waiting to be cook. The Extra Fine noodles uses the extra fine cutter to cut. The Fine noodles uses the fine cutter to cut. The taste and texture was also different. With Fine, it was chewy and stay firm and in shape despite being cooked and fried in the wok. With Extra Fine, it tasted more like Mee Sua, being very soft. But it does not tear easily. 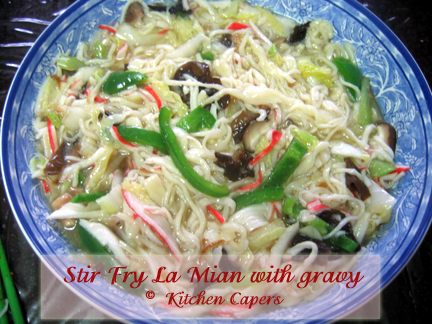 I'd look forward to your many more creative "mee" dishes And very beautiful la mian you made! Your steps are very clear, my la mian and wanton mee all gone, time to make another batch. Gina, thanks you for the La Mien recipe. Will try them out soon. must learn to be gentle with la mian. it will break when you apply too much pressure/strength/force. When I first made it, the first batch broke too. Then I try again. I even show my teen girl how to pull it. After 2 to 3 tries, she managed to get it right. I will try again. 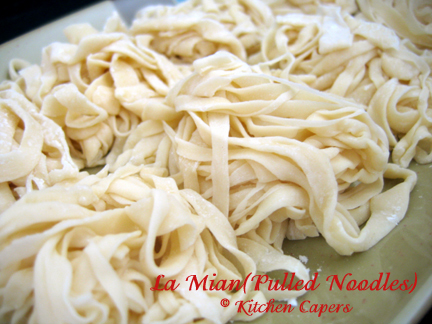 I think the trick is also to let the noodles rest a gain for a while after cutting them into strips. I realised that the first few I try to pull aftetr cutting, it breaks easily. But the subsequent ones are better. seems softer. i have a pasta machine too. Will try with it. Made La Mien yesterday. Hubby said it is good. My mil tried one strand and said the texture is nice and not soft & soggy. Cooked Kon Loh Mee with minced meat for hubby and Soup Noodle with crab stick & minced meat for kids & myself. Thanks Gina for this nice recipe. 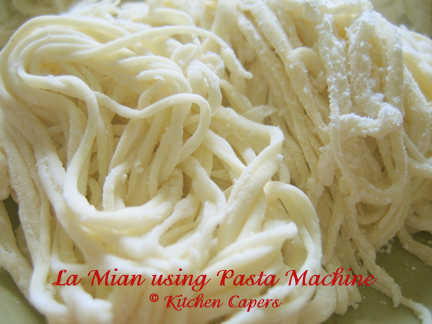 My hubby said to get pasta machine to make next time... Yippee... Time to go shopping when I have the time!! Thanks Gina! Will use the pasta machine...better put it into good use or DH will say its another white elephant!